Ramton fridges are among the best fridges in Kenya. However, before you purchase any fridge, seeking reviews is important. Since I trusted my friend, I decided to give it a try.I went straight to Nakumatt Mega and purchased Ramton fridge for Ksh 30,000. I have been using the fridge since then and never had issues.The good thing is that it is a double door fridge capable of partitioned into upper floor and lower floor so as to accommodate items of all types. 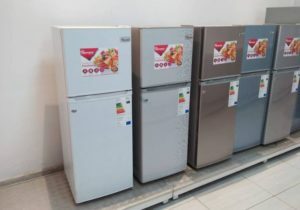 In Kenya, there are several Ramton fridges;the cheapest goes for Ksh 12,000 while the most expensive is sold at Ksh 100,000. One thing you will note is that the fridges are priced fairly in relation to Samsung and LG fridges yet they are of the same quality as other brands. Another thing is that they are as beautiful as Samsung fridges. There are two types of fridges: double door and single door. Double door fridges are the best when it comes to big homes while single fridges perform well if you’re living in a single room without a large family. If you haven’t bought a fridge,it’s good to buy double door fridge.Double door fridge is one that has two doors. This fridge will allow you to store milk,juice and other drinks in one door and onions, vegetables and other cooking spices in another door. This way,you will avoid mixing them in one location within the fridge. Can you buy Ramtons and Leave LG and Samsung fridges? If you were planning to buy Samsung and LG fridges,it’s good to think otherwise.Hear from the horse’s mouth.Ramton fridges have been tested,which is why it’s popularity has surged.Nowadays people are keen on how and what to spend.It’s pointless to buy something for Ksh70,000 when you can get another one of the same quality for Ksh40,000.